Olbia in Thrace, bronze dolphin coin. 4th to 5th century BC. Size : 22.6 mm long. Weight : 1.83 grams. Grade : VF with a well defined dolphin shape, with a clear dorsal fin. 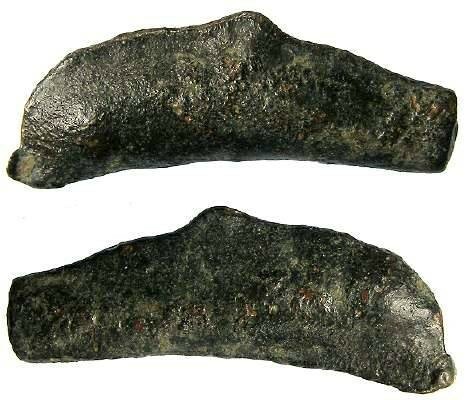 Although shaped like Dolphins, there is no real doubt these cast bronzes were used as an early form of money in the Black Sea area. This particular example does not have an inscription, but there are some scarce types that have moneyer's or magistrates names on them. These are attributed to Olbia, first because they tend to be found in that region, and secondly because some examples have an inscription that may be an abbreviated form of the cities name.